Donald Trump’s first concrete decision as commander in chief was a major fiasco that killed nine children, eight women, and a U.S. soldier in a botched raid on al Qaeda in Yemen. The operation — which Trump reportedly approved over dinner — also failed to catch its reported target and severely damaged a local clinic, mosque, and school. It’s hard to imagine Donald Trump making the situation worse in Yemen, but he did. Impoverished to begin with, Yemen is two years into a civil war that has killed 10,000 people and displaced millions. A U.S.-supplied bombing campaign has turned schools, hospitals, essential infrastructure, and ancient heritage sites into rubble. And a U.S.-backed blockade is preventing the trade of food and basic goods, starving a country that previously relied on imports for 90 percent of its food. 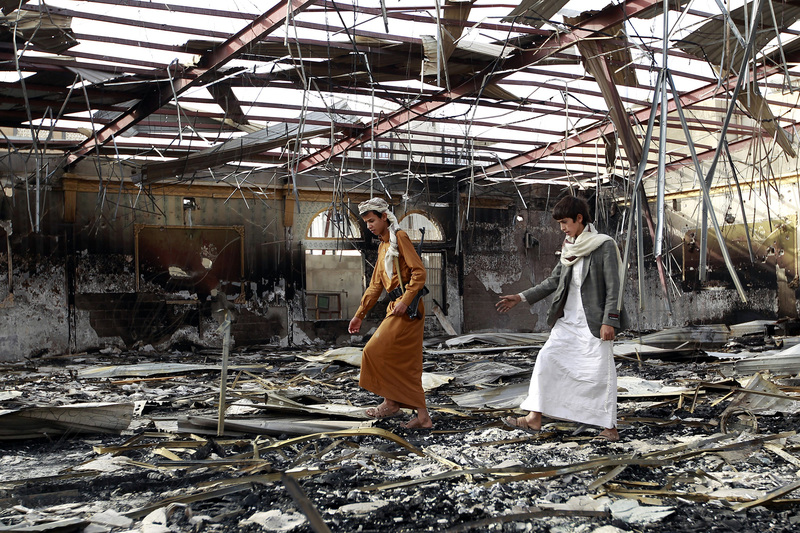 Armed Yemenis walk on the debris at a wedding hall reportedly hit by a Saudi-led coalition air strike in the capital Sanaa on July 10, 2015. As a result, the United Nations this week declared that Yemen is on the brink of famine. Officials held a news conference Wednesday to announce that 19 million Yemenis — more than two-thirds of the country’s population — need some form of humanitarian assistance, 7.3 million people do not know where their next meal will come, and more than half of the country’s medical facilities have closed. Even so, the toll of Trump’s botched raid was so high that it drew criticism from the ousted government-in-exile of Abd Rabbu Mansour Hadi — the party supported by the U.S. and Saudi Arabia in Yemen’s civil war. The New York Times reported Tuesday that Hadi’s ministers had withdrawn their support for the U.S. to conduct ground missions in Yemen. The Pentagon and the Hadi government quickly denied the report, but Hadi’s foreign minister then said the government is conducting a “reassessment” of the raid. Trump is evidently so sensitive to the criticism that he has tried to smother it by shamefully smearing critics and trying to stifle dissent. White House Press Secretary Sean Spicer accused critics of being disrespectful of Chief Special Warfare Operator William “Ryan” Owens, the Navy SEAL Trump sent to his death. “I think anybody who undermines the success of that raid owes an apology and does a disservice to the life of Chief Owens,” Spicer said. On Thursday, after Sen. John McCain, R.-Ariz., described the raid as “a failure,” Trump — who repeatedly insisted it was a success — lashed out on Twitter, saying McCain’s criticism “emboldens the enemy” — likening congressional truth-telling to sedition. Yemen is one of seven countries included in Trump’s immigration ban. In New York City, Yemeni-Americans have led strikes and large protests against the ban, which separates many from their extended families. 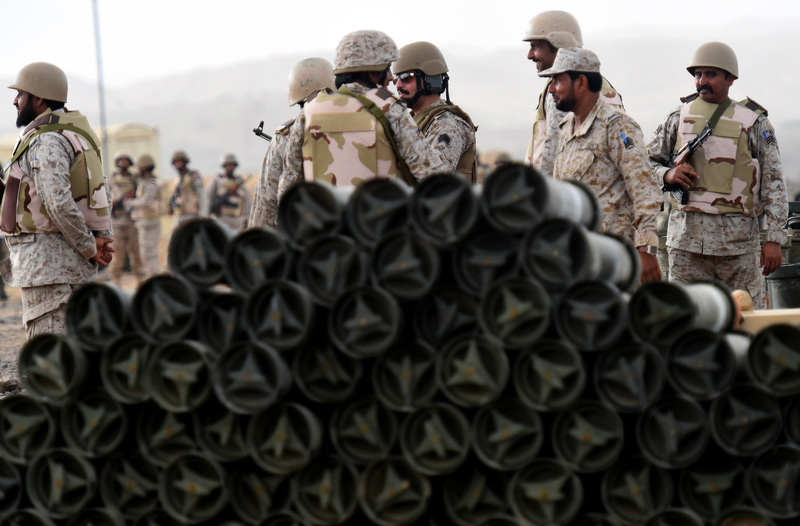 Saudi soldiers from an artillery unit stand behind a pile of ammunition at a position close to the Saudi-Yemeni border, in southwestern Saudi Arabia, on April 13, 2015. Saudi Arabia began bombing Yemen in March 2015 after Houthi rebels overran the capital and deposed Hadi, the Saudi-backed leader, who now splits his time between the Saudi capital and southern Yemen. The U.S. has been a silent partner in the kingdom’s campaign against the Houthis, refueling warplanes, supplying targeting intelligence, and resupplying the coalition with more than $20 billion in weapons. Congress has not yet been notified of the weapons shipment, and the Pentagon declined to comment on it. The Saudi-led bombing campaign has also allowed al Qaeda’s Yemen affiliate — the target of Trump’s botched raid — to grow exponentially in personnel and finances. According to State Department reports, the group quadrupled in size the year that Saudi Arabia started bombing. The same year, al Qaeda seized a prominent port city, which netted them an estimated $5 million a day off customs tariffs and smuggled goods. Al Qaeda in Yemen is also fighting the Houthis. While Trump ramps up U.S. militarism in Yemen, Democrats have largely ignored the plight of the Yemenis. When a Yemeni refugee who had lost her father to Saudi bombing questioned Nancy Pelosi at a CNN town hall on January 31, Pelosi condemned Trump’s Muslim travel ban — but said nothing about U.S. support for Saudi Arabia’s war. “Your family is suffering because our president is reckless” she said.